« Elephants, Monkeys and Bears, Oh My! Last spring, Sean and I woke up Saturday morning and decided to make a not-so-typical breakfast. We headed to Treasure Island in the pouring rain, picked out our ingredients, and came home ready for a feast. On the menu: Bacon wrapped dates stuffed with goat cheese and pesto scrambled eggs on ciabatta. The key to the bacon wrapped dates is to make sure your dates are not pre-pitted and big enough to stuff. I would recommend medjool dates. The first step is to slice them lengthwise until you hit the pit. 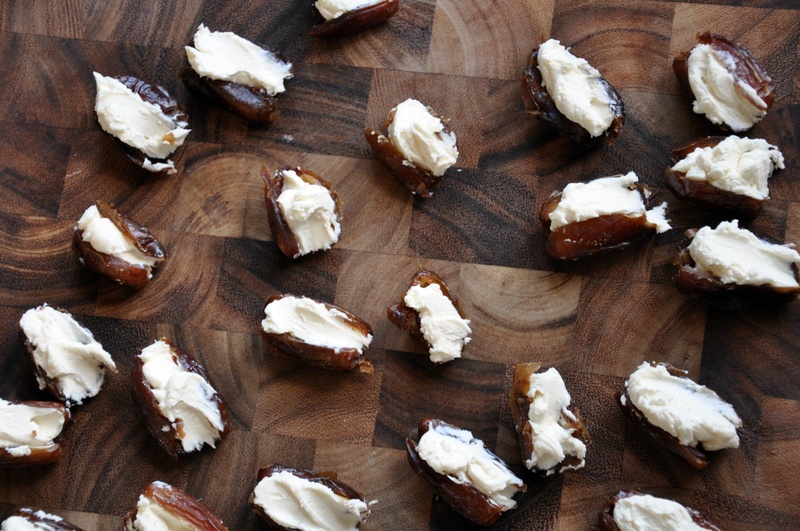 Open the date, take out the pit, and spread a good amount of goat cheese into the crevice, then close the date. Wrap one piece of bacon around the date, using a toothpick to help secure the package. Cook in a skillet over medium-high heat until the bacon begins to get crispy. Take off the heat and set on a paper towel to soak up any extra bacon grease. 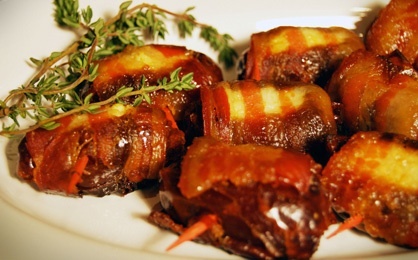 If you want to taste test bacon wrapped dates before trying to make them on your own, check out a Spanish or tapas restaurant, they are bound to have them on the menu! Now, it is time to start your scrambled eggs. In a bowl mix 4 eggs, a splash of milk, a pinch of salt and pepper, and about a tablespoon of cream cheese. I learned this trick from a friend’s Italian mom after having the best homemade scrambled eggs on the planet. The cream cheese helps make the eggs fluffy and creamy. Beat the mixture and add the pesto. Cook the scrambled eggs on medium heat. While eggs are cooking, cut a ciabatta bun in half, butter, and lightly toast. Now it is time to prepare the sandwich. 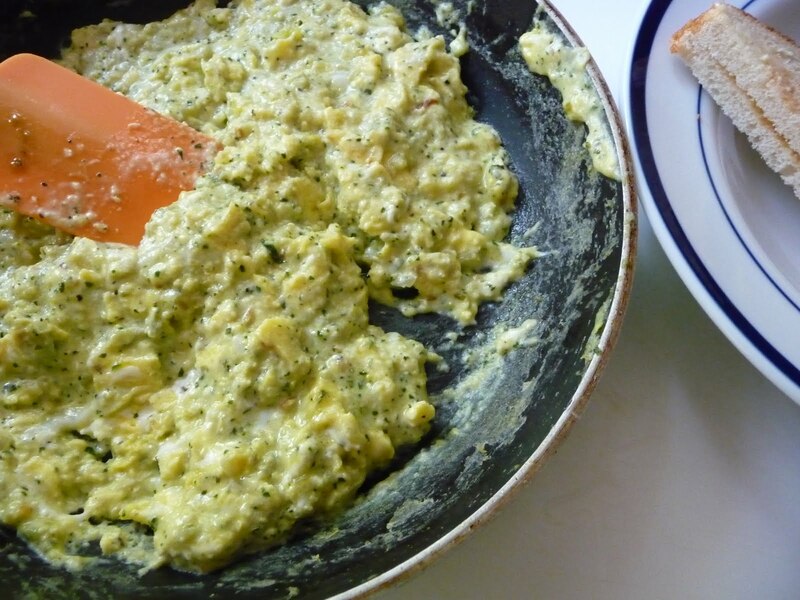 Spread some extra pesto on one side of the bun and spoon on the scrambled eggs. I like to add a slice of ripe tomato and a few slices of avocado; Sean also likes to add another piece of bacon. For those who like a little heat, dash a bit of Tabasco on your eggs and enjoy. If you are getting sick of the traditional eggs and pancakes, these two recipes will makes for an upscale and delicious Sunday morning brunch.